Chelsea have announced club-record revenues of £443.4 million for the year ending June 30, 2018. The club revealed their financial results on Monday, the figures showing they enjoyed a 22.7 per cent increase to their revenues from the previous year, when they made £361.3m. It is the first time the club have ever managed to exceed £400m in a single 12-month period. On top of record revenues, Chelsea also finished their financial year with a club-high profit of £62m after tax. 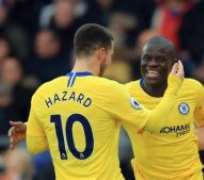 The club confirmed such figures were significantly boosted by the fact they made a £113m profit in the transfer market, helped by selling the likes of Nemanja Matic and Diego Costa. “The club has now posted a series of record-breaking revenue figures and our profit margin has increased in consecutive years,” Chelsea chairman Bruce Buck told the club’s website.